Another well-known transitional board from the 70s, designed by the Campbell Brothers with the help of Bing’s head shaper at the time, Mike Eaton, the Bing Bonzer was one of the first tri-fin surfboards to be built. 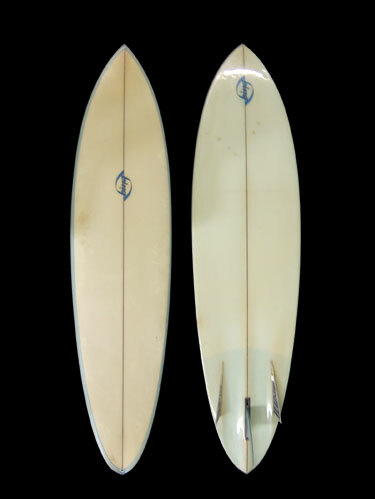 This board is characterized by its double concave bottom, two long low-profile side fins, and single center box setup. A board built for speed and drive off of the turns similar to riding the edge of a ski/snowboard, the Bing Bonzer is a retro glimpse into today’s surfing and maintains its functionality in medium to large hollow and powerful surf. (excerpt from the Bing Surfboards website). This surfboard was recently donated by Phillip “Flippy” Hoffman. the water was warm remember wearing only sleeves up to dec 12th! !